Before a word had been spoken, the nearly 200-strong audience that filled the Stevenson Event Center was on its feet with a raucous applause. 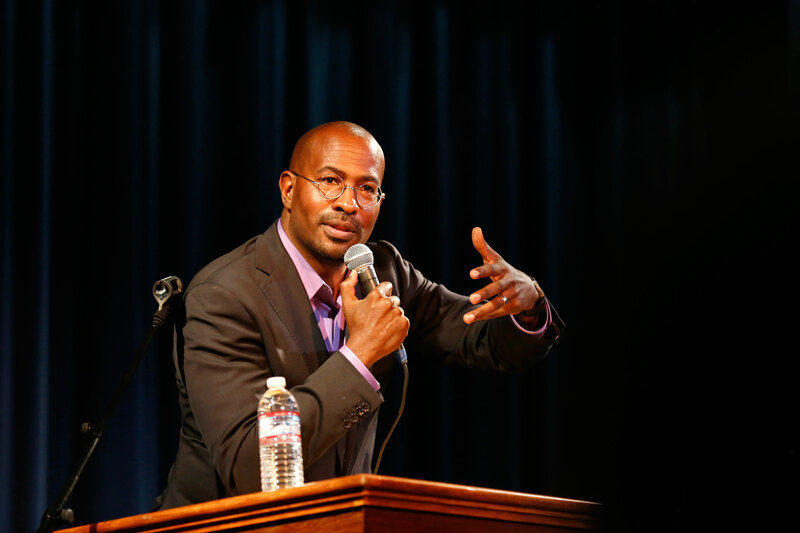 Many of those standing had never heard Van Jones speak, but that didn’t matter. His presence alone was enough to lift the room. Engaging Education’s (e²) annual Speaker Blowout doesn’t deal in “baby food” speeches, so the Wednesday evening audience cheered for the “grown folk” version. The event features speakers who educate students about issues affecting access to higher education, especially for students of color. Past speakers have included Dr. Michael Eric Dyson and Dr. Cornel West. “Speaker Blowout is about getting students to feel more comfortable in political spaces,” said Destinee Barnes, a UC Santa Cruz student and e² program coordinator who helped organize the event. Jones, a political activist and Yale-educated attorney, is a regular CNN contributor and was President Barack Obama’s special advisor for green jobs. Covering a range of topics, he challenged students to critically assess their role in changing the future. “You don’t understand who you are, how special you are, how important you are to the folks who aren’t here,” Jones said. Anthony Kapel “Van” Jones was the ninth generation in his family to be born in the U.S., yet the first of his family to be born with all the rights granted in the 1964 Civil Rights Act. His father, Willie Jones, became an orphan at the age of five. Being forced to become the family provider meant Willie didn’t have time to go to college until later in life. But once he did graduate, he put his brothers, cousin and children — including Van — through college as well. Willie’s belief in the importance of education never left Van. Members of the audience snapped their fingers and spoke in acknowledgment of their experiences of racism. In a campus climate survey administered in 2011, 55 percent of African American/Black respondents at UCSC marked that they felt “insulted or threatened because of their race” at least sometimes. Jones stressed that education and racism were closely linked. “Willie Jones created an atmosphere where we understood that the fight for justice and the fight for our own excellence as students was the same fight,” Van Jones said. But it was a certain kind of excellence. Another of Willie Jones’ maxims that stayed with his son was about the kinds of smart people in the world. There are those, he said, who take simple things and make it sound complicated to impress others, and those who take complicated things and make it sound simple to empower others. The importance, Van Jones emphasized, was on being the latter. Eron Lake, who attended Jones’ speech and is e²’s graphic design and information technology staff, said this stagnates organizing. While Jones praised students for their critical thinking skills, he encouraged them to think about how those skills could be used in a more productive way. Jones has established and co-founded a number of organizations, including the Dream Corps, a self-described “social justice accelerator.” One of its initiatives, #cut50, seeks to cut the U.S.’s incarcerated population by half over the next decade. His experience with the harsh realities of the school-to-prison pipeline informs his views on the trend of so-called safe spaces on university campuses. While advocating for a more inclusive and civil atmosphere, he also spoke about his concerns of an over-insulation from the real world. Up to 45 percent of activities that individuals are currently paid to do can be automated by adapting technology that already exists, according to a January 2016 report by McKinsey & Company. Those activities represent about $2 trillion in annual wages. “We’re fighting to get poor, black and brown kids job training in industries that aren’t going to exist in five years,” Jones said. Citing Santa Cruz’s “key strategic position” in its proximity to Silicon Valley, the heart of the tech revolution, Jones urged the students in attendance to see their importance in relation to their own communities. Jones’ work focuses on remedying the lack of underrepresented groups in tech. #YesWeCode, a Dream Corps initiative, seeks to help 100,000 young people from low-opportunity backgrounds find success in the tech sector. The success of underrepresented groups in the technocracy of Silicon Valley forms one of the four corners of enacting real change, Jones said. But, he added, to truly control the future, there also needs to be diversity in the mediacracy of Hollywood, the plutocracy of Wall Street and the democracy of Washington D.C.
Eron Lake, who is also a double major in computer science and game design, agreed with Jones’ sentiment of needing activism in all areas of the real world. But before that can happen, Jones said millennials have to discover who they are.